Wise questions are: can you offer a critical perspective on the existence or operation of an object or social institution? Certainly, you have strong opinions on many things, and as an artist/inventor, you can exercise your new expressive possibilities in the process of defining and perhaps critiquing culture. Making good art and invention can often arise from opinions or unique observations, which we may wish to communicate to our audience. Memes are like our genes and can have a powerful impact on culture and offer a lasting change in society. Genes will allow you to live for 100 years if you are lucky, but your memes, or ideas, are timeless if well thought out and profound. A meme is a unit of information that replicates from brains or printed matter, such as books and electronic media, and is passed down to other brains or electronic media. A meme is a unit of cultural evolution, which is self-propagating and analogous to the gene. This term was created by Richard Dawkins in the book The Selfish Gene. Think of the idea of 3D perspective that the Italian sculptor and architect Filippo Brunelleschi was able to refine, and how this transformed the artworks that followed, and the new ways of seeing and creating the illusion of three dimensions in a two-dimensional space. Perspective is one part of the visual perception of space that is related to the point of view from which it perceived, and is a way of creating three-dimensional images on a two-dimensional surface. Think also about the relation of the tools and the ideas that are related to those tools. Are your tools limiting your thoughts? Might another tool allow you to better express your idea or should you dismiss tools until your ideas are well developed? I am of the opinion that the idea should precede the tool, but one can also approach work that is more tool-driven, or the concept and the tool can be approached simultaneously. Either way avoid work that is just about the inherent capabilities of just tools. Flashing a lamp or LED may demonstrate technical capability but does it offer anything new? Think about the morphology, or the structure and form, of the work in relation to its behavior in the piece or installation. Imagine existing systems as a model for the work. If you can, imagine a pet or animal you have observed, think for a moment about the relation between the physical aspects of the project and the behavioral aspects of it. A work that engages conceptual thinking, where ideas have preceded technology is "Spamtrap" by Bill Shackelford. This interactive installation prints, shreds, and blacklists spam email. The idea here determined the technology the artists used to solve the conceptual question, which was: can I create a robot that automatically collects, traps and shreds spam? Spamtrap by Bill Shackelford. 2006. Photo compliments of Bill Shackelford. In this installation Shackelford has created email addresses to lure the spam and has set the installation to print and shred each email as it arrives, providing a catharsis for those of us inundated with spam. The installation is also feeding spam blacklists on the web with information gathered from all the received spam. In turn, it helps to feed spam filtering systems across the web that are working to reduce the amount of spam we all receive. Click here for more information about Spamtraps. 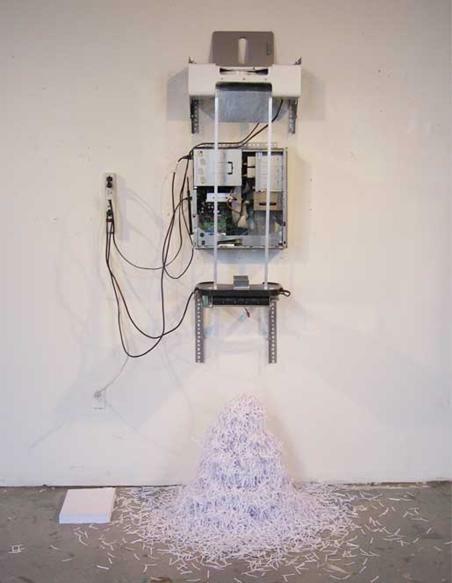 In this work, the artist used a “Pentium II computer connected to a wireless network, personal printer, personal shredder, aluminum rails, Spamtrap email addresses, automatic printing software, email client software, antivirus software, and a SpamCop user account.” The paper is recycled after the spam email has been shredded.